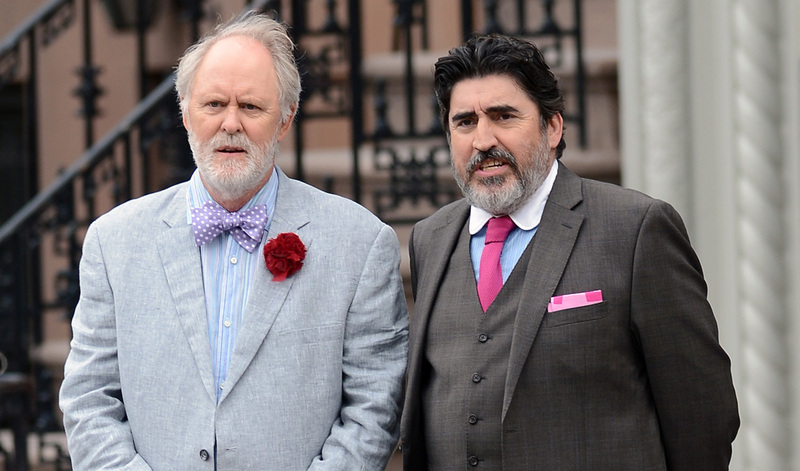 Ben (Lithgow) and George (Molina) are a gay couple who, after nearly forty years together, decide to get married. They have a wonderful day surrounded by friends and Ben’s family, but their happiness is short-lived. George works as a music teacher at a Catholic school; when the archdiocese finds out he’s now married, he’s dismissed. Unable to afford the upkeep on their apartment, they’re forced to sell it and seek somewhere else to live. They round up their friends and Ben’s family and ask them to put them up until they can find somewhere. Ben goes to live with his nephew, Elliot (Burrows), his wife Kate (Tomei) and their teenage son Joey (Tahan). Meanwhile George moves in with their friends and neighbours, Ted and Roberto. At his nephew’s Ben finds himself sharing a room with Joey, a situation that is uncomfortable for both of them. Kate, a writer working on her latest book, soon tires of Ben’s presence as he interrupts her work. Elliot, a music producer, works long hours and doesn’t always see the upheaval Ben’s being there entails. Issues surrounding Joey’s friendship with another boy called Vlad (Tabach) begin to cause arguments between Elliot and Kate, and Ben does his best to remain neutral but he’s clearly affected by the atmosphere in their home. George also encounters problems at Ted and Roberto’s. They have a large group of friends that are always visiting. George’s sense of isolation begins to increase, and the frustration of not finding work straight away, or being able to find a new place to live, soon wears him down. He finds solace by visiting Ben as often as he can, and the two of them rekindle their life together. One day, Ben has a bad fall and his injuries leave him with his right arm in a sling. As he recovers, Joey and Vlad are discovered to have been stealing books from their school library. This leads to a confrontation between Elliot and Kate that results in her feelings about Ben being made apparent. And then George has a chance meeting with Brit Ian (Coulson), one that could mean he and Ben have somewhere new to live. A measured, emotionally gratifying movie about long-term commitment and mutual dependence, Love Is Strange features the kind of performances that seem effortless, a script that is both poignant and relevant (and would remain so whatever the nature of the main relationship), direction that is carefully nuanced, and a set up with consequences that are entirely convincing. It’s a modern day chamber piece, a look at the lives of a couple whose near forty year relationship is threatened by the vicissitudes of contemporary living. It’s also one of the most emotionally honest movies made in recent years. The relationship between retired painter Ben and music teacher George is one based on a love of the arts, but more importantly it’s the love they have for each other that the movie focuses on. Their artistic backgrounds inspire their life together; without each other they stumble and – literally in Ben’s case – fall. Once they reconnect with each other, they become re-energised, their adoration for each other so genuine that the viewer can’t help but be moved by it. After some time apart, George has had enough. He hurries to see Ben, and when he gets to him he collapses, sobbing with relief, in Ben’s arms. It’s a powerful, heart-rending moment, but where most writers would end the scene there, co-scripters Sachs and Mauricio Zacharias let the scene play on to include Elliot and Kate and their reactions. Both are made ill at ease by George’s emotional outburst, and walk away, their discomfort magnified by the lack of such a devotion in their own marriage (there’s an unresolved subplot that hints at Elliot having an affair; Kate is distant toward him as a result). It’s a brilliant moment, quietly yet impressively shot, and with such a visceral impact it’s almost shocking. As the beleaguered duo, Lithgow and Molina are superb, investing both characters with charm, honesty, intelligence, depth of feeling, and pathos. There’s very little that’s sentimental or saccharine about their performances either; they play each emotion and feeling with a refreshing lack of embellishment, unafraid to play it straight. It’s a joy to watch them, two experienced actors taking the material laid down by Sachs and Zacharias and making it sing. It’s a testament to both men that, although the focus is more on Ben than George, it always seems that they’re sharing the same amount of screen time, that the audience is investing the same amount of energy in following their individual trials and tribulations. Lithgow essays Ben’s increasing frailty with authority, while Molina conveys George’s sadness at his predicament with practiced ease. There’s not a false note from either of them throughout. The same can be said for Tomei, whose portrayal of Kate continues to show her at the top of her game; the moment when she responds to Elliot’s accusation of being too soft with Joey is so vivid and so powerful it’s alarming. Tahan and Burrows offer solid support, and the narrative is beautifully endorsed by several pieces by Chopin, their melancholy refrains providing a moving counterpoint to Ben and George’s travails. A special mention as well for editors Affonso Gonçalves and Michael Taylor, who keep the rhythm of the movie at such a steady, effective pace throughout that it’s almost like “watching” a piece of music. But overall, this is Sachs’s triumph, a balanced, emotive, wonderfully constructed and delivered movie that rewards on every level. 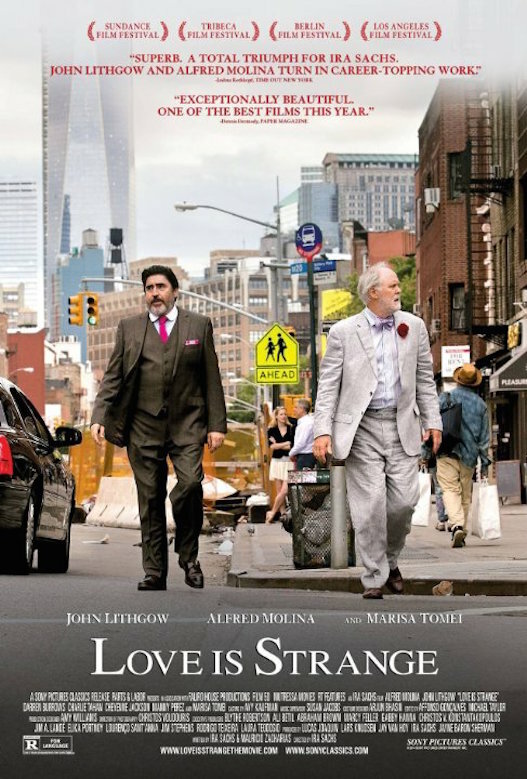 Rating: 9/10 – with the feel and style of a European arthouse movie, but married to an American indie movie sensibility, Love Is Strange is simply, a pleasure; Lithgow and Molina make a great team, and Sachs throws his hat in the ring as someone whose next movie should definitely be sought out.